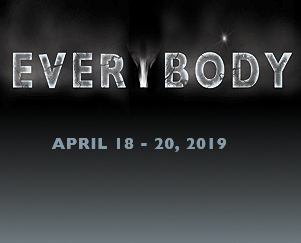 This modern riff on the fifteenth-century morality play Everyman follows Everybody (chosen by lottery each performance) as they journey through life's greatest mystery - the meaning of living. EVERYBODY gained recognition when it became a finalist for the 2018 Pulitzer Prize. EVERYBODY is rated PG-13. What people are saying about EVERYBODY! "This is theatre rather unlike anything you might have seen... unusual, unconventional and eye-opening. ... EVERYBODY tells the tale with emotional heft; but it is not only provocative and involving, it is also funny. Wildly funny , in fact." - Huffington Post. "EVERYBODY fills the heart in a new and unexpected way." - The New Yorker. When purchasing tickets, you will be purchasing general admission seats. Upon arrival each patron will draw their seat. Choose the same color - each seating section will be assigned one color. This will allow the audience to experience the performance not just as a spectator but as an actual participant. *Should patrons have a need to be seated by others in their party due to age or medical necessity they should inquire in the box office in advance or see a house manager upon arrival. This will allow the audience to experience the performance not just as a spectator but as an actual participant.